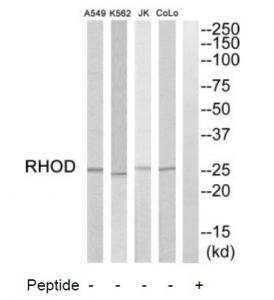 Western blot analysis of RhoD expression in K562 (A); Raw264.7 (B) whole cell lysates. Anti-RHOD mouse monoclonal antibody (TA503891) immunofluorescent staining of COS7 cells transiently transfected by pCMV6-ENTRY RHOD(RC201722). 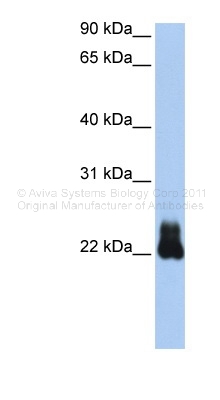 HEK293T cells were transfected with the pCMV6-ENTRY control (Left lane) or pCMV6-ENTRY RHOD (RC201722, Right lane) cDNA for 48 hrs and lysed. 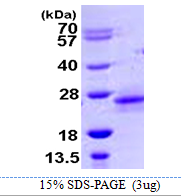 Equivalent amounts of cell lysates (5 ug per lane) were separated by SDS-PAGE and immunoblotted with anti-RHOD. 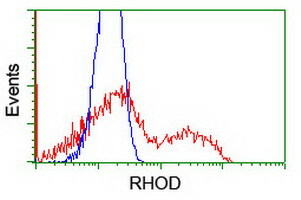 HEK293T cells transfected with either RC201722 overexpress plasmid(Red) or empty vector control plasmid(Blue) were immunostained by anti-RHOD antibody(TA503891), and then analyzed by flow cytometry. 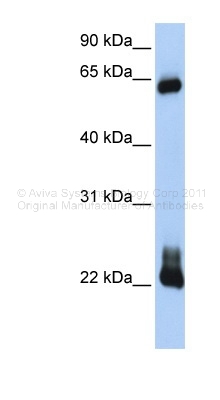 Western blot analysis of extracts from COLO205 cells, K562 cells, Jurkat cells and A549 cells, using RHOD antibody.The lane on the right is treated with the synthesized peptide.